I'm a real cheapskate. And if you're reading this, you probably are, too. How do I know this? Because other people want the regular tips for saving money. But you know all those. You've done them. You're looking for the slightly insane ones. Well, I got such a huge response when I wrote my first 30 Slightly Insane Things I Do To Save Money that I'm back again with 30 more. This post contains affiliate links mixed with links to hilarious stories on this blog. If a link takes you to somewhere outside of Unremarkable Files, it's probably an affiliate link which means I will get a small commission for purchases you make at no extra cost to you. Think one year ahead if you can. Shop for next year's school supplies in mid-September, next year's Christmas decorations in January, and next year's clothes for your kids at the end of the season when they're on clearance. Repurpose clearanced holiday merchandise. Sure, it looks holiday-themed in the aisle surrounded by all the other stuff, but a lot of the time it's basically the regular product with holiday packaging. I like to buy all my wrapping paper after Christmas; even the not-Christmasey looking stuff goes on sale and I can use it all year long. I used to plan a week's worth of meals and go shopping every Saturday; now I still shop once a week but I only plan 5 days of meals and on the weekends we're forced to use up stuff from the fridge and cupboards. Even if we're out of something like milk that we use all the time, I try to wait one more day before grocery shopping because something else always ends up coming home with the milk. Our oldest child is 12, and we've paid for a babysitter exactly twice. Part of it is that we don't go out nearly often enough, but part of it is that we trade babysitting with another family whenever we can. Our health insurance will pay $200 a year toward gym memberships or sports fees. Others give incentives for preventive medicine like yearly physicals. Does yours? Speaking of health insurance, you should read the fine print of yours. On some plans, it might cost less out of pocket for you to visit urgent care instead of the emergency room for stitches, go to Minute Clinic at CVS instead of your pediatrician for your kid's ear infection, or request the generic prescription instead of the name brand. If you have some money in savings but you can't invest it or put it in a CD because you might need it, consider a high-yield savings account. If you have an Amazon Prime membership, you can watch a lot of movies and TV for free with Amazon Instant Video. The ones that aren't free are only a few dollars, which is still better than having to put on pants and drive to a Redbox. List broken appliances on Craigslist or Freecycle with full disclosure; some people fix up bikes or lawnmowers to resell or use and will actually take yours off of your hands. If you can't sell your old electronics on eBay or Craiglist, use the Best Buy electronics recycling program to get rid of them for free. No disposal fees! There are a ton of workout videos on Amazon Instant or YouTube, as opposed to a gym membership. And it's more fun to work out at home with a toddler crawling on your head, anyway. Learn to coupon. I will never again pay a cent for toothpaste, shampoo, or conditioner because of coupons. Even if you don't want to be an extreme couponer who gets 112 bottles of mouthwash for 50 cents, understanding the principles of couponing will help you save money regularly. Use conditioner instead of shaving cream. I get my conditioner for free by couponing, but even if you pay full price, a cheap bottle of VO5 is cheaper than a bottle of shaving cream and lasts longer. Sign up for online coupon sites like Checkout 51 and Ibotta. You just take pictures of your receipt and submit them, money goes into your account, and you can cash out once you reach a certain amount. I grind my teeth, and a new mouthguard last spring was going to cost me $667. My dental insurance covered nothing. So instead I went to CVS and got a 2-pack of at-home moldable mouth guards for $30. They are a little clunkier than the ones the dentist will make for you, but even if each of them only last a year it will literally take me 40 years to meet that $667 price point. I buy dry beans, cook large batches of them in the crockpot, the freeze bags to use in place of canned beans. Dry beans are easier to take home, are healthier for you, and most importantly, cost 1/6 as much as canned beans. You can get them super-cheap at restaurant supply stores, but there isn't one close enough to make it worth my while so I just get 1-pound bags at the grocery store. If your state requires vehicle inspection stickers, wait until the first day of the next month to renew yours. They expire on the last day of the month, so if yours expires August 31 go get your inspection on September 1. Your new sticker will be good through the end of next September and you've just gotten a free month. Change your default printer settings to "black only" or "grayscale." Most of the time, printing in color is a total waste. Even if you're only printing black text, your printer still uses some colored ink unless you specifically tell it not to. Get a free cell phone plan. Yes, free. I currently have service with Freedom Pop which is great for my data and texting needs, but I'm not happy with the call quality. A friend who hates spending money almost as much as I do recommended a free plan with Ring Plus, so I will have to check them out. A lot of drugstores have prescription loyalty rewards programs. You might get $5 in store credit for every 10 prescriptions you fill there, for example. Special makeup remover pads come in an 80-count container for $4.99; I can find baby wipes for 1 cent per wipe (couponing!) and cut them into fourths to use instead of makeup remover. You don't even need to do the math. It's just way, way cheaper. I carry around discounted gift cards for the stores I shop at most often. I find them on Gift Card Granny and buy at a 10-20% discount (i.e: a $100 gift card for $80 or $90.) You could actually gift these to people, or use them yourself. Either way, you win. We rarely eat out, but when we do we try to combine it with a deal. Check sites like Groupon, Restaurant.com, or even Gift Card Granny for someplace you'd like to eat. Or you can ask for gift cards to restaurants at holidays and save them for date night. When something breaks, learn to fix it on YouTube. From changing oil to cleaning your dishwasher to unclogging your sink, there's a tutorial for it online for free. Phillip could get a degree in auto mechanics from YouTube for all he's learned there. He once knew nothing about cars; now he does our brakes in the garage. You can throw money at your kids' wardrobes endlessly, and they'll still outgrow everything in a season. In general, we don't buy more than our kids can wear in a week, which is how often we do laundry. They each have a pair of church shoes and a pair of everyday shoes for each season, and that's it. Any more just adds clutter to our tiny mudroom. Buy with price per ounce in mind. Usually stores make it really easy for you by putting it right on the tag on the shelf. Bigger boxes are often, but not always, the best deal. A bunch of regular-sized packages of store brand cereal from your grocery store is often cheaper than a huge bulk container of name brand stuff from Costco. Keep a box of stocking stuffers (or Easter basket stuffers). And hide it, obviously. Whenever I run across $1 toys, cheap candy, or after-the-holiday clearanced Easter/Christmas stuff I think my kids might like, I throw them in the box. Re-use large 5x7 or 8x10 envelopes you get in the mail. We buy practically everything besides groceries on Amazon, so these are in no short supply in our house. You just need to tape the flap shut when re-using, and I write the address on a separate piece of paper and tape it to the front to cover up any previous labels. What about you? What slightly insane shortcuts do you take to save some money? 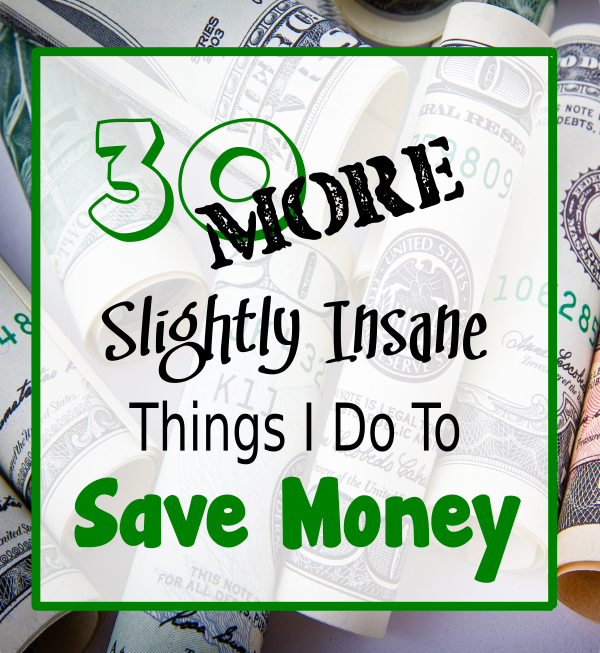 Leave your input below and don't forget to check out the original 30 Slightly Insane Things I Do To Save Money for more ideas. I just signed up for Checkout 51, and I'm so excited! Thanks for the tip. These are all great ideas. I always forget about the usefulness of youtube, but I'm planning-in a week or so-to use it so I can try to learn how to change the oil on our car. I just think it's so lame that we always have to make the time to pay other people at Wal Mart to do it, when I'm sure my husband and I can figure it out. I'm excited, but a little nervous because I know nothing about cars, so it's good to hear that your husband was once in that place of knowing nothing :) I've never heard of Freedom Pop and don't know what towers it uses, but I recently changed my plan to US Mobile (it uses T-Mobile towers, I believe) and for the most part my call quality has been good (it will occasionally drop calls which is annoying, but it's not unbearable). It is half the price per month of what I had been paying previously, so I'm pretty happy (and also kicking myself that I was paying so much per month for a few years when I could have been saving so much! Oh well. You live and you learn). Repurposing holiday merchandise is such a moneysaver! When I was engaged, my parents bought ton of clearance Easter m&ms in pastel colors, so that a few days before my wedding we had a party in the kitchen and sorted through them to pull out our wedding colors. These are genius! I feel like a kid on Christmas with so many new things to try out. (I remember your last post on this mentioning you cut the dryer sheets in half. Blew my mind.) Thanks for putting this whole list together! And every time I say in this cheesy voice, "I just saved 50% on dryer sheets!" and Phillip just rolls his eyes. Never gets old. We also made that mistake when my 2-year-old cut his head a few months ago. Except it was during business hours, we just didn't think of it until afterward! That's so funny you mention that - you can save a ton of money on wedding decorations if you know what your colors are and are looking for them on clearance. (Red stuff after Christmas/Valentine's Day, green stuff after St. Patrick's, pastel things after Easter.) Sometimes your brain is just full and that's okay, but if you can spare the room to think ahead it really does save you money. And I think Freedom Pop uses Sprint. I've never heard of Gift Card Granny. Thanks for that! And I love the idea of reusing those envelopes. Great post, Jenny! I loved couponing!! But now that I'm single, just doesn't make as much sense. Even tho, when I do occasionally score a deal, I share or donate. The clearance- oh yeah!! I've been doing that, after Christmas, etc thing for decades! I just learned about Gift Card Granny and it's my new favorite website. Yes, when I don't need 30 tubes of toothpaste in the closet anymore couponing won't be nearly as useful. But it's certainly good for right now!